If the driver fails the basic control skills test, the test will stop and the applicant cannot proceed any further in the CDL testing. Encroachments – The examiner will score the number of times you touch or cross over an exercise boundary line or cone with any portion of your vehicle. Each encroachment will count as an error. Pull-ups – When a driver stops and pulls forward to clear an encroachment or to get a better position, it is scored as a “pull-up.” Stopping without changing direction does not count as a pull-up. You will not be penalized for initial pull-ups. However, an excessive number of pull-ups, will count as errors (you will be advised the number of non-scored pull-ups you are allowed for each skill you are tested on). Outside Vehicle Observations (Looks) – You may be permitted to safely stop and exit the vehicle to check the external position of the vehicle (look). When doing so, you must place the vehicle in neutral and set the parking brake(s). Then, when exiting the vehicle, you must do so safely by facing the vehicle and maintaining three points of contact with the vehicle at all times (when exiting a bus, maintain a firm grasp on the handrail at all times). If you do not safely secure the vehicle or safely exit the vehicle it may result in an automatic failure of the basic control skills test. Final Position/Inside Parallel – It is important that you finish each exercise exactly as the examiner has instructed you. 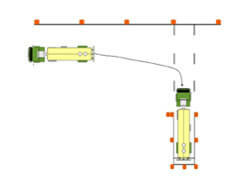 If you do not maneuver the vehicle into its final position as described by the examiner, you will be penalized and could fail the basic skills test. You may be asked to back your vehicle in a straight line between two rows of cones without touching or crossing over the exercise boundaries. You may be asked to back into a space that is to the right rear of your vehicle. You will drive straight forward to the outer boundary. From that position you must back the vehicle into the opposite lane until the front of your vehicle has passed the first set of cones without striking boundary lines or cones. You may be asked to back into a space that is to the left rear of your vehicle. You will drive straight forward to the outer boundary. From that position, you must back the vehicle into the opposite lane until the front of your vehicle has passed the first set of cones without striking boundary lines or cones. You may be asked to park in a parallel parking space that is on your left. You are to drive past the entrance to the parallel parking space with your vehicle parallel to the parking area; and back into the space without crossing front, side or rear boundaries marked by cones. You are required to get your entire vehicle completely into the space. You may be asked to park in a parallel parking space that is on your right. You are to drive past the entrance to the parallel parking space with your vehicle parallel to the parking area; and back into the space without crossing front, side or rear boundaries marked by cones. You are required to get your entire vehicle completely into the space. You may be asked to sight-side back your vehicle into an alley. You will drive past the alley and position your vehicle parallel to the outer boundary. From that position, back into the alley bringing the rear of your vehicle within three feet of the rear of the alley without touching boundary lines or cones. Your vehicle must be straight within the alley/lane when you have completed the maneuver.